Pleasant Hearth pellet burning stoves provide will warm your heart and your home with highly efficient and effective indoor zone heating. This stove has been EPA certified with a 85% efficiency rating. Perfect for single-family or mobile home use with little assembly required. All Pleasant Hearth pellet burning stoves feature chrome handles, air wash system for cleaner air, solid cast iron door with large ceramic glass viewing area, and a 5 year limited warranty. Stoves operate best when fuelled with premium pellet fuel. Heating coverage area is up to 2,200 sq ft.
Heats up 2,200 Sq. Ft. The Englander 1,500 sq. ft. Pellet Stove has a simple 1-touch ignition and generous 40 lb. hopper. It features a user-friendly control panel that allows individual adjustment of the feed rate. A unique, double-auger system offers long life and smooth pellet feed into the fire box. This stove comes with components needed for a required outside air intake system. It is also adaptable for mobile-home use. Stylish cool touch nickel door handle complements stove's Satin Black finish to look great with any home's dicor. The traditional design of the Classic Fireplace screen has a black powder coated finish that adds both beauty and durability. The simplicity of this screen will bring out the accents in your fireplace, drawing your attention directly to the fire and upward toward your mantel. Easily adjust the screen with convenient handles on side panels. This fireplace screen guard is the simplest solution to protecting your home from escaping sparks. The mesh surround covers most fireplace openings. It also includes handles to easily move or shift your screen guard. It's classic design and black finish make it the perfect fit in any home decor. 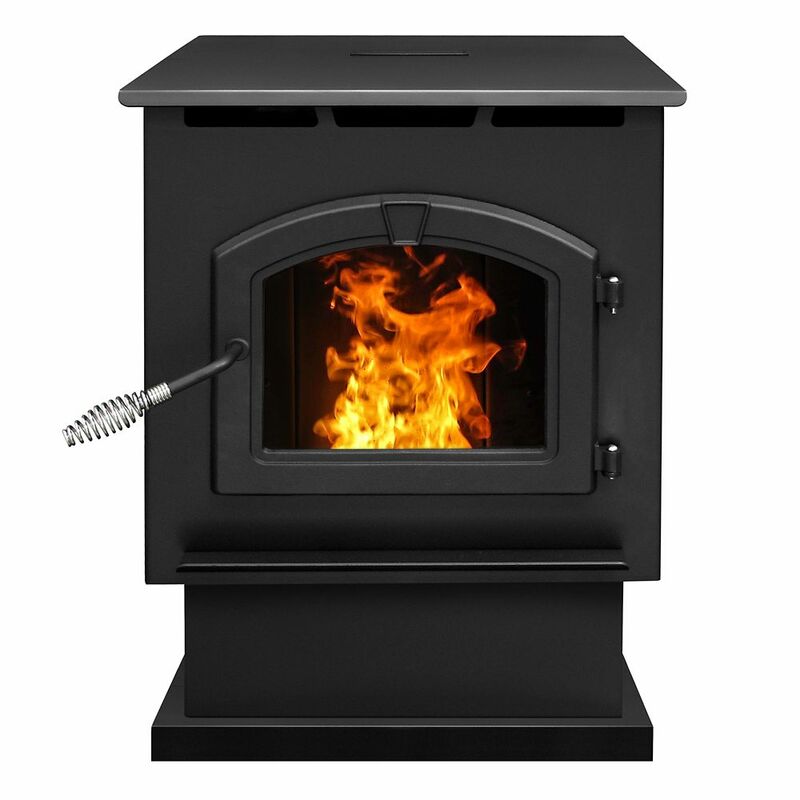 PH50PS 50,000 BTU Large Pellet Stove Pleasant Hearth pellet burning stoves provide will warm your heart and your home with highly efficient and effective indoor zone heating. This stove has been EPA certified with a 85% efficiency rating. Perfect for single-family or mobile home use with little assembly required. All Pleasant Hearth pellet burning stoves feature chrome handles, air wash system for cleaner air, solid cast iron door with large ceramic glass viewing area, and a 5 year limited warranty. Stoves operate best when fuelled with premium pellet fuel. Heating coverage area is up to 2,200 sq ft.
PH50PS 50,000 BTU Large Pellet Stove is rated 4.2 out of 5 by 59. Rated 1 out of 5 by harris from had the stove one year. replaced the grommets three times. now have a vibration so loud you can't... had the stove one year. replaced the grommets three times. now have a vibration so loud you can't hear the tv. can't find the problem. Rated 5 out of 5 by Crisco from Works just fine. The only issue was getting the spring... Works just fine. The only issue was getting the spring over the door handle. Rated 5 out of 5 by rk from I've just finished cleaning my stove to get ready for the coming winter. I have now had it one ye... I've just finished cleaning my stove to get ready for the coming winter. I have now had it one year and I am very pleased with the stove and its function. A lot of ash can collect on various parts, and a brass brush is very useful in loosening this stuff to get it out of there. That's a bit of a pain, but once a year is often enough to do it and compared to sweeping my chimney several times a year, this is cake. I am so pleased with my first stove, I just bought another installed to replace my other wood stove for the coming winter. Rated 4 out of 5 by Jm from We just set up the stove and started using it.... We just set up the stove and started using it. It lights quickly, and seems to throw good heat. I did find it frustrating to figure out how to access the Outside Air Kit connection, as well as remove the shipping tabs. This instruction could be clearer. Rated 5 out of 5 by Christine from We love our new pellet stove. Heats our 1800 sq... We love our new pellet stove. Heats our 1800 sq foot home nicely. We keep it in our basement and it heats our entire home. My only complaint would be hearing the pellets drop every now and then. I would recommend this stove. Rated 4 out of 5 by Chase from I love my Pleasant Hearth 2200 sq ft pellet stove.... I love my Pleasant Hearth 2200 sq ft pellet stove. However I am just not clear as to what pellets burn the best in the stove. From my research I do know that certain pellets are better than others. I also realize it is most effective in a open floor plan setting.